Cannot have Attachment cards attached. Response: After Doctor Bancroft is wounded, pay 1 to choose a character. Place X wound tokens on that character. 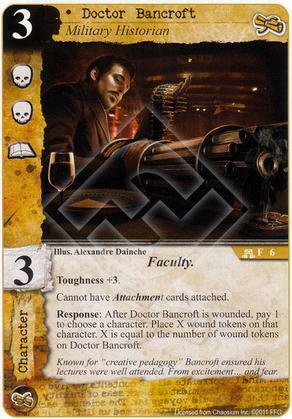 X is equal to the number of wound tokens on Doctor Bancroft. Flavor Text: Known for "creative pedagogy" Bancroft ensured his lectures were well attended. From excitement... and fear. Using him in my Khopesh deck. Bancroft can't use the Khopesh himself, but he can take wounds from it and turn each wound into bigger wounds. Also have Mu in the deck for healing my Self-inflicted Khopesh wounds.